Facebook profile can virtually be taken at face value. That’s what Highland Community College student Shannon Polly’s Honors Program project research revealed. The 1-year-old Honors Program provides opportunities for advanced study and specialized research. They are opportunities usually reserved for upperclassmen. It’s open to new students with an ACT score of 25 or higher or those who have graduated in the top 10 percent of their high school class. Current students must have completed 12 or more credit hours with a GPA of 3.5 or higher. Polly pondered why and how people use the social networking tool.“I learned people accurately portray themselves on their Facebook profiles,” she said. However, Polly discovered people were usually less forthcoming on personal Web sites. Delving into the Facebook phenomenon became the theme of a Social Psychology research proposal, which Highland instructor Paul Rabideau assigned. Rabideau required studentto research a subject, discover research gaps and fill those holes. He also volunteered to serve as Polly’s Honors mentor. “I think this project provided Shannon with the unique opportunity to see firsthand how behavioral research is completed,” Rabideau said. For instance, Polly’s research included conducting surveys and comparing the results to the Big Five personality inventory, including openness, conscientiousness, extroversion, agreeableness and neuroticism. With Rabideau’s guidance, Polly expanded the research proposal into a full-blown project. In addition to writing the proposal, he noted Polly also conducted an original project about the connection between personality traits and Facebook use. While the Honors Program project provided the chance for advanced study and specialized research, Polly walked away with other honors – first place in a poster session at Midwest Institute for Teachers of Psychology (MISTOP). Honors student Haylee Endress’ interest in dairy, discovery and animals converged in her investigation of infectious mastitis of cattle. While the project allowed Endress to learn about the condition, doing the research has helped open a door. “I learned more about what it will take to become a large animal veterinarian. This project also helped me create a relationship with the clinic,” she said. Instructor Juliet D’Souza concurred that the project provided some real-world experience. D’Souza also noted Endress’ full embrace of the scientific method. D’Souza said Endress performed the same project as last semester. So, Endress has been able to collect more data and answer more questions that arose. “She is truly fulfilling the true nature of research,” she said. 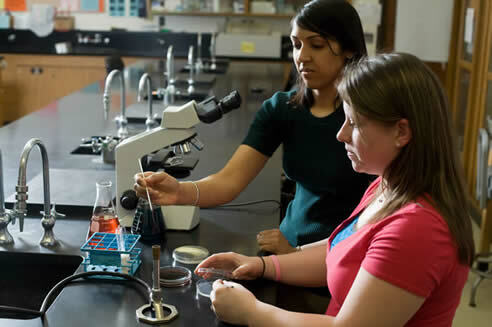 Registering for classes before other students and being recognized during Honors Convocation and Commencement are just some Honors Program benefits – besides advanced study and specialized study alongside Highland faculty. Honors students also have the opportunity to compete for additional transfer scholarships to 4-year colleges and universities. Click for more information about the honors program or contact program director Juliet Moderow at juliet.moderow@highland.edu / call (815) 599-3578.